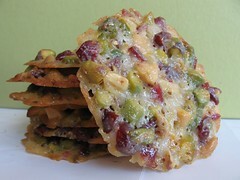 Pistachio-Cranberry Florentines with White Chocolate and Orange - Do You Know The Muffin Man? Notes: The most time-consuming part was skinning the nuts; blanched almonds can be purchased, but I've never seen pistachios without skins. These spread quite a bit in the oven and will burn quickly so keep an eye on them. Even in airtight containers, the florentines' edges lost their crunch after a day, probably from the moisture in the dried fruit. I skipped the white chocolate drizzle. Chika made these too.